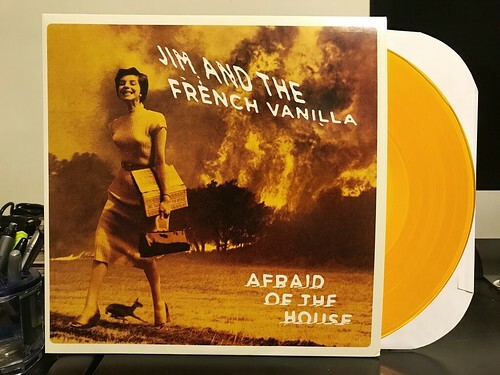 Jim and the French Vanilla is a spin off project by Jim Blaha, more famously known as one half of the Blind Shake's Blaha brothers. Those boys in the Blink Shake have stockpiled so much good will with me over the last few years that it was a no brainer to pick this up. I'm not sure exactly what I was expecting from this, something a little more poppy and traditional I think, but Afraid of the House defied my expectations. I guess the most surprising aspect of this album to me is how much it sounds like pieces of the Blind Shake. The jagged downstroke guitars are there as are the otherworldly solos and the drowned surfer vibe that has been creeping in on their more recent records. These comparisons aren't complaints. If anything, I'm kind of happy to have something with a similar vibe to Blind Shake to listen to. I think where Afraid of the House really stands on its own is how varied it is within the context of the world it has created for itself. Yes, most of the songs have signature sounds and tones that are consistent from song to song, but there is a lot of variety on this album. You've got a faster paced rockers like "I'm Just Sitting Here," slowed down ones like "Not Even War" and frantic pounding on songs like "I Have to Slow Down." It is the very definition of a good record. I like all of the song and it's just something that's fun to listen to. It is missing that certain something that would make it a drop dead great album, but it's absolutely worth checking out.